It’s the legal responsibility of all employers to provide a safe environment for not only their employees – but contractors, tradespeople, visitors and customers to the workplace as well. For Bill at Jim’s Test & Tag Coffs Harbour, it’s common to find that many new as well as established workplaces fail to meet their legislative obligations in regards to workplace health and safety. The risks as well as the consequences can be devastating – but with Jim’s Test & Tag Coffs Harbour, it doesn’t have to be that way! Customers in and around Grafton, Sapphire, Moonee, Boambee, Bonville, Coramba, Urunga, Bellingen, Kempsey, Port Macquarie and Wauchope on the North Coast call on Bill at Jim’s Test & Tag Coffs Harbour to manage health and safety in their workplace. “The better informed the better the outcome” says Bill, who heads up the Jim’s Test & Tag business in Coffs Harbour as Franchisee. “We are passionate about providing an effective and results-oriented service – complete, relevant and effective health and safety solutions for businesses and workplaces”. Having previously worked as a private contractor providing Workplace Health and Safety solutions to the community, Jim’s Test & Tag Coffs Harbour offers outstanding credentials in health and safety, and knows how to work with businesses to achieve real health and safety solutions. Keeping your workplace safe, compliant and worry-free is simple. From test and tag services to fire extinguishers, exit and safety signage, RCD testing and first-aid, we’re the one-call solution; professionals working for professionals – so our advice is sound – leaving you with the peace of mind that your business and your employees are protected. Never worry about record-keeping again – as a Jim’s Test & Tag customer, you’ll have access to our world-class record keeping systems; information which is accessible, relevant and kept in one easy-to-reach place, everything you need to remain compliant. 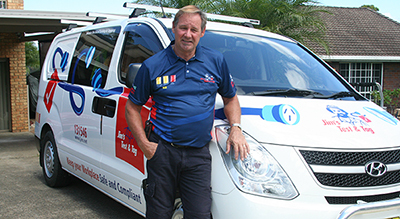 We’ll work with you in the hours which suit you, as regularly or as occasionally as you need; and all our fully insured and qualified services are delivered with a 100% guarantee – proof that when you call Jim’s Test & Tag in Coffs Harbour you’re taking the best possible care of your business. Be part of an organisation that is driven by people who have the best interests of their customers at heart – call today for your free no-obligation quote.